Cobia (Rachycentron canadum) | Better Know a Fish! Carnivorous fish require proteins and oils from their animal diet in order to grow. As a result, aquaculture of carnivorous fish requires the use of food pellets created from grinding up small fish like menhaden and sardines — an expensive and exhaustible resource, and a practice that often shifts the fishery of small fish species from more valuable sales as human food to feed-manufacturing sales. But recently, researcher Aaron Watson and colleagues have evaluated a feed mixture that is entirely plant-derived, yet satisfies the nutritional requirements of cobia and potentially other cultured fish species (Watson et al. 2013). Watson recently completed his doctorate under Allen Place at the University of Maryland Center for Environmental Science. I asked Watson about the importance of this development and the future of marine fish aquaculture. Americans are famously suspicious of new foods. Even cobia has been slapped with a fancy trade name like “black salmon” (though it is neither black nor a salmon). What does cobia taste like and why might people like it? What are some interesting facts about cobia reproduction and juvenile growth? How do you get such a large marine fish to spawn in captivity? This species has great potential for aquaculture because of its rapid growth rates, reaching market size in well under a year in a variety of culture conditions. Spawning in captivity has been achieved in multiple places around the world simply by photo-thermal manipulation, meaning simply changing the temperature and light regimes of the tanks [where] broodtsock are held in, to mimic natural spawning seasons. Cobia females can produce up to two million eggs about every two weeks during the spawning season which can last several months, so egg and larval production can occur year-round with multiple tanks of broodstock under different photo-thermal regimes. Larvae begin feeding approximately three days after hatching, can be fed rotifers and artemia, which are easy to culture, and then be weaned on to dry feeds after only a few weeks — unlike some species [which] may require these relatively expensive live-feed set-ups for much longer. Why is it important for us to move away from fish-based feeds in aquaculture? The biggest reason to move away from fish-based feeds for aquaculture is to allow the industry to expand and increase production — sustainably — as the global population and demand for protein continues to increase. 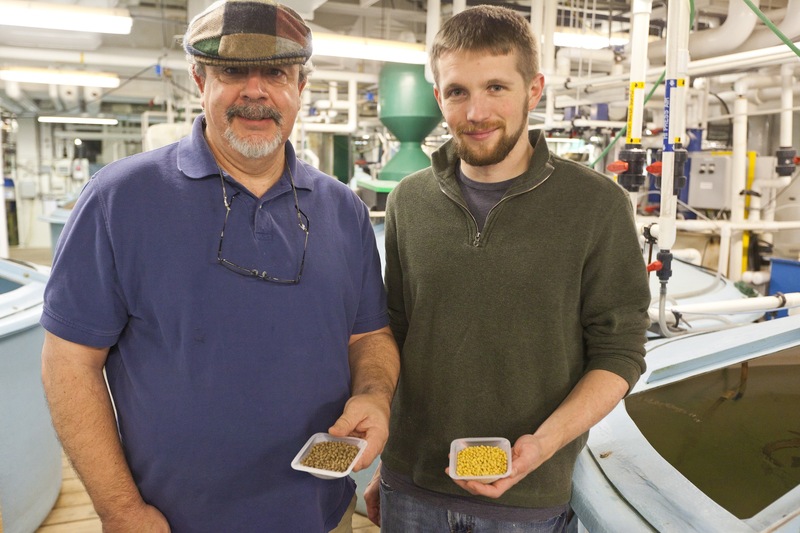 The USDA and NOAA have established alternative feeds as a priority area for aquaculture research, so there is a great deal of effort around the country and the world going into the research to find and develop fishmeal and fish oil replacements for virtually every species in intensive culture and those being developed for large-scale aquaculture. This is not a new area of research — and a great deal of work has been done over several decades in the development of feeds for aquaculture, and more recently, ways to reduce and potentially eliminate fishmeal and fish oil use with more readily available, sustainable alternatives. Most notably among the potential and currently used alternative protein and lipid sources [are ones that] come from terrestrially cultivated crops. As many people are well aware, many of the ocean’s fisheries are at maximum sustainable capacity, yet the demand for seafood increases every year. Fishmeal and fish oil production come from those fisheries, so unless we are able to reduce the quantities of these ingredients that are then utilized to feed farmed fish, the aquaculture industry cannot increase overall output. Aquaculture sometimes gets a bad rap, due to examples of overcrowding, antibiotics and nutrient pollution. What are some positive aspects of marine fish aquaculture? In general, the positive aspects of marine aquaculture are that it can reduce the pressures on wild stocks, which would hopefully reduce some of the potentially negative impacts of over-fishing. This is especially important when considering that many of the species that are fished for human consumption — such as tunas, sea bream, cobia, etc. — rely on stocks of smaller bait fish such as menhaden, anchovy, sardine, and capelin. These smaller species are the ones generally being fished for fishmeal and fish oil production. So if we can sustainably raise fish for human consumption both through aquaculture in general and reducing the quantities of fishmeal and fish oil required for aquaculture, the hope is we can take fishing pressure off both the smaller forage species and the larger predatory species, helping ecosystems and food-webs return to more natural states. The type of aquaculture systems that we use here at the Institute of Marine and Environmental Technology are called recirculating aquaculture systems (RAS). These are great systems for aquaculture because they are land-based, self-contained systems that give us a lot of control in terms of temperature, salinity, and nutrient load. These systems are not connected to any local water source — we use Baltimore city tap water, dechlorinated, and add in the required salts and nutrients to as closely mimic natural sea water as possible. This type of system could be set-up virtually anywhere with the proper infrastructure. These systems allow us to optimize environmental conditions for multiple species in separate systems all within the same facility to maximize growth and reproductive potential. Since these systems are not connected to the local ecosystem, there is no fear of escapes, polluting the local environment, or having our systems and fish at the mercy of changing environmental conditions that could prevent sustained optimal growth. Most pathogen issues are minimal since these systems can contain the entire life-cycle of a species from broodstock to eggs and larvae, through to juveniles being reared to market size and harvest. Minimizing the potential introduction of pathogens greatly reduces the need for antibiotic use, and recirculating the water through biological, mechanical, and ozone or UV treatment allows these systems to maintain high water quality, encouraging not only fish health, but optimal growth. At some point we experience an encounter with nature that hits us to the core. Was there a memorable experience in your life that helped steer your interests toward fish biology and aquaculture? I went on a seventh grade class field trip to the Florida Keys where we spent a week snorkeling, conducting plankton tows, and learning how to identify all kinds of species on the reefs and in the mangroves. After that trip I knew I wanted to study marine biology and eventually got into raising clownfish while in college. Taking a batch of clownfish eggs and raising and watching them develop all the way into juveniles got me hooked on aquaculture. Thank you for your time, Aaron. This entry was posted in Actinopterygii, Marine Fish, Perciformes, Researcher Interviews and tagged aquaculture, Atlantic Ocean, black kingfish, black salmon, cobia, gamefish, Indian Ocean, Pacific Ocean, Perciformes, Rachycentridae, Rachycentron, Rachycentron canadum. Bookmark the permalink. I read that article, too, Cathy! That’s what inspired this post. The researcher interviewed here is the lead author of that same study profiled in the Bee (actually Washington Post) story.